Study: Recall a time in life when you were disconnected from God. What helped you restore your relationship with Christ? Pray: How can you grow closer to the Lord today? What spiritual resources, sacraments, or fellowship can help you thrive? Serve: Who in your life is disconnected right now? How can you reach out and help them? The relationship between vine an branches is simple: the branches, connected to the vine, draw their strength and nourishment from it. Cut off, they die. 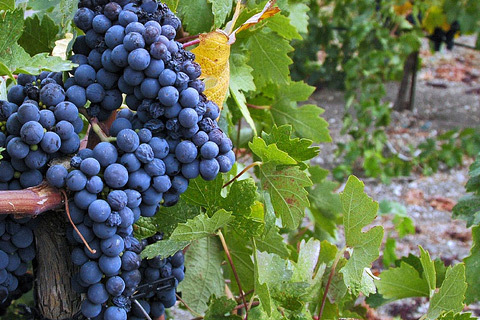 Raising grapes and making wine were crucial at the time of Jesus (and still important today) and this gardening image provides a powerful insight in two crucial aspects of human life. As branches connected to Christ, we draw the grace we need from the Lord. It’s his death and resurrection that gives us life; his forgiveness that restores our relationships with God and one another; and his power that we call upon when we confront the obstacles and stumbling blocks in the world. Our lives, dependent on Christ, thrive with his life within us – in the Scriptures, the Sacraments, private prayer, and fellowship with one another. Our lives are interconnected! Drawing strength from Christ – the central vine – we thrive; his strength in turn becomes the power which we extend into the hearts of those whose lives touch our own. Today: draw near to Jesus and allow his love to fill our hearts! May we pour his love into the lives of each and every soul we meet! May we call upon the Lord for what we need – regardless of our vocation in life – to find our way! This homily was given at Cathedral of Christ the King on Sunday, April 26, 2015. Study: How have I responded to rejection in my life? What has given me strength? Pray: What challenges do I need to set before the Lord today? Serve: Who is struggling with rejection in my life? How can I help and support another? At first glance these readings seem to be a jumble: what do stones have to do with shepherds? How are they connected to the person of Jesus Christ? What we discover points to Jesus as the Lord who has encountered rejection and triumphs through his saving sacrifice. The power he has comes from the Father, who sent his Son to save us, even when we didn’t understand. What’s more, God keeps reaching out to us – breaking through our ignorance, weakness and sin – to build a bridge that leads us to new life. God comes to us, in our need, to save and set us free. The invitation today is one of acceptance. Will we embrace the Good News of Christ? Will we respond to the faith, hope, and love of the Gospel and allow our lives to be touched by God’s blessing? Is there anything blocking me from reaching out to the Lord? Thus, the path which the Lord walked becomes our own. Our spiritual compass – pointed toward Jesus Christ, inspires us to stay the course even when we are mistreated and misunderstood. Like the shepherd and the stone, we can face rejection with the promise of hope – for we draw strength from the one who triumphed in his struggles to bring triumph to our lives. 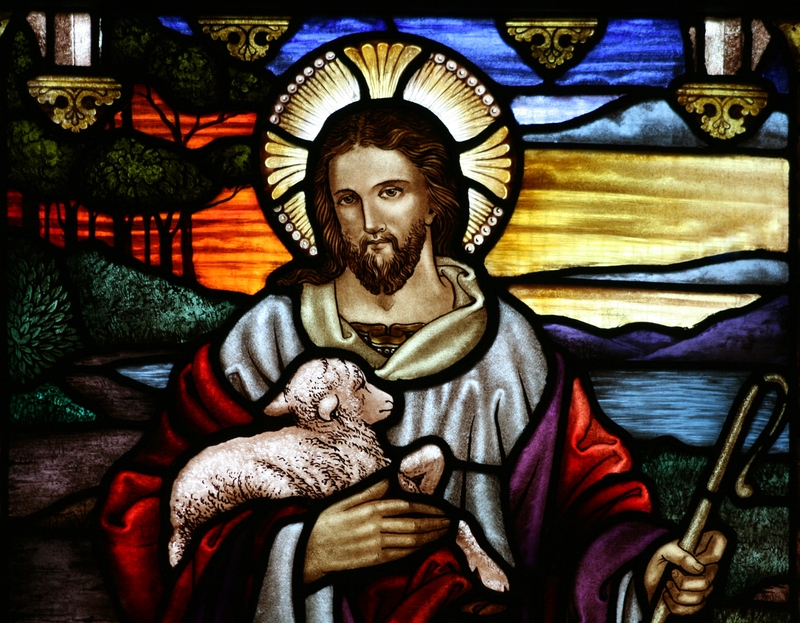 The Good Shepherd, Alfred Handel, d. 1946 – photo by Toby Hudson (20 December 2009); stained glass, 770 x 600 pixels, St. John the Baptist’s Anglican Church, Ashfield, New South Wales. What is the script of my thoughts, words, and actions? If I were to write down what I think, speak, and do would it point to Christ? Would it even include Jesus? We are witnesses for the Lord, and as his disciples we can make changes in our lives – changing the script – so that grace of Christ renews and strengthens our lives. This homily was given at St. William Church in Foxboro, WI on April 18, 2015. Study: Where do I consistently observe the Lord in my life? How do I show others that I follow Jesus Christ? Pray: Does something need to change in my life today? Call upon the Lord for grace and strength. Serve: Is someone in your life struggling, searching for faith or challenged to live it? How can you help? How do people know that we are Christians? What “proof” do we offer that clearly reveals the Lord we follow? The pattern of our faith is observed within these arenas of daily life. Everything begins with thought: what comes from within us and moves outward is revealed by what we say and do. Our speech signals our behavior: what we say; how we say it; to whom we speak; and the context in which it is said. Our actions close the deal: our behavior ultimately rests in the consistent pattern of the real results we accomplish. Knowing this, we can then ask: does the Lord reside in these areas? Is he present in my thoughts, words, and actions? I find it helpful to evaluate this question with a daily examination – reviewing the day with a mental “written transcript” where I walk through what I thought, said, and did – looking for Christ’s presence in my life. Everyday, in 1001 great and small ways, we have the chance to show those around us that Jesus Christ is the Lord of our lives. We are uniquely placed in the world to touch the hearts of those in our midst; they will see in us a pattern that will either proclaim the Good News…or else we testify to something else. Pastoral Note: This weekend is First Communion for many kids at the Cathedral. Please keep them and their families in your prayers! 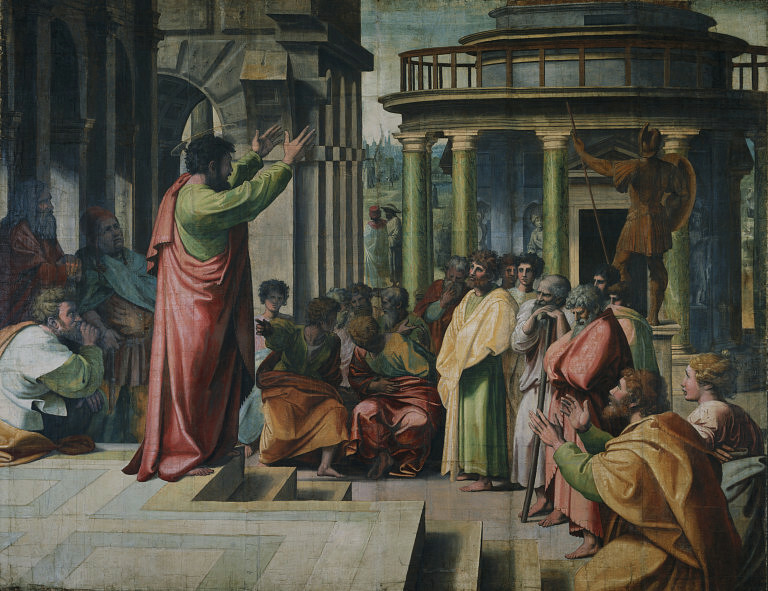 St. Paul Preaching in Athens, Raphael; 1515, 768 x 581 pixels, Royal Collection of the United Kingdom. 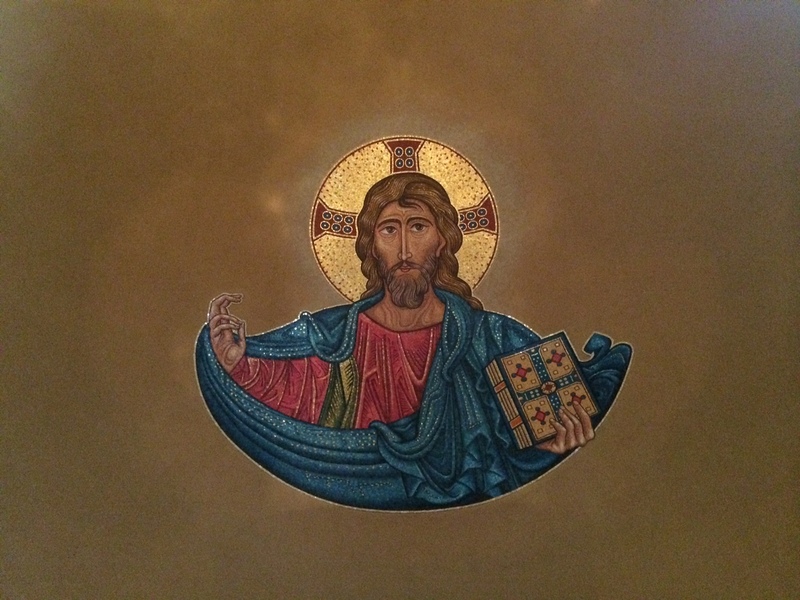 This homily was given at the Cathedral of Christ the King in Superior, WI on April 12, 2015. How do we make our personal prayer real? This homily podcast highlights practical tips that bring power and meaning to our personal prayer. This presentation was given to the Pastoral Care ministers at the Cathedral of Christ the King on April 11, 2015.